Keeping in mind the diverse requirements of the clients, we offer our clients an extensive range of Conduit Connectors that are easy to install and are performance oriented. We are reckoned as one of the most stupendous Brass Conduit Connector Manufacturers and Suppliers in India. The materials ranging i.e. 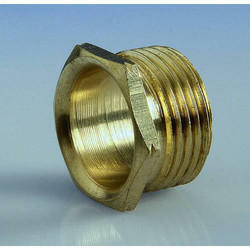 Brass to BS 2874 are used in the manufacturing of the Brass Conduit Fittings are of premium quality that ensures high durability, tensile strength and resistivity to various adverse conditions. We manufacture Plastic Conduits And Conduit connectors. We are one of the well-distinguished companies in the market that is into providing Flexible Conduit Connector. We are offering a wide range of Conduit Connectors. Our Conduit Connectors are available in various sizes and specifications. These Conduit Connectors can be customized as per our customers specifications and availed at industrial leading price. For more details refer to the attached PDF. • Flexible and excellent tenacity. • Glossy surface. • Small bending radius. • High mechanical strength. • Resistant to oil, acid and solvents. • Antifrictions . • Free of Halogen, phosphor and cadmium, passed RoHS . 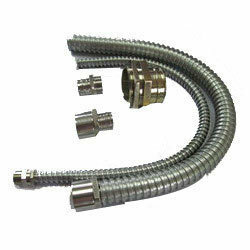 It is designed in three pieces to provide extra protection and used in Galvanized / PVC coated flexible conduit system. This connector fits into inside helix of the conduit and is used to connect the flexible conduit to the equipment, enclosure or other conduit system. This item "Channel Section" is manufactured with the M.S. cold rolled steel formed by the modern, sophisticated machinery & equipments. A high level advance technology is used for manufacturing the product.